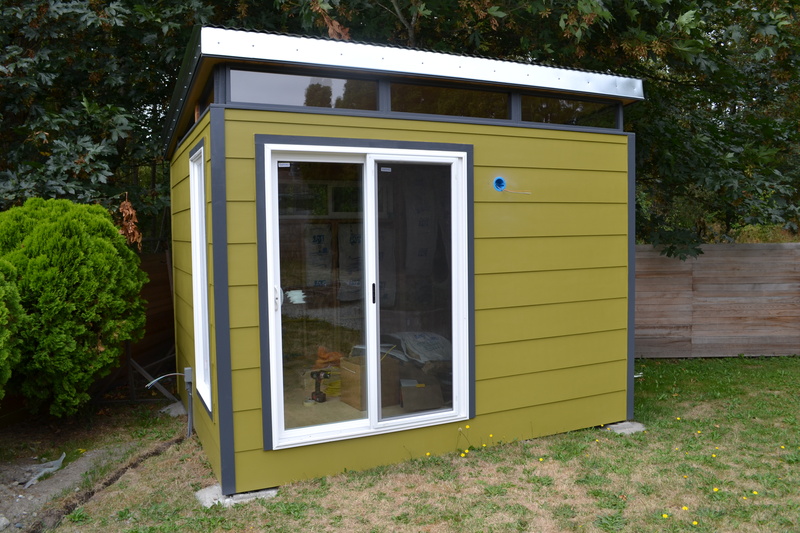 Tami and Peter’s Modern-Shed in West Seattle is an 10′ by 12′ studio office. WEST SEATTLE — Walking into Tami and Peter’s living room in West Seattle, you can understand why the couple is attracted to Modern-Shed. Peter, a web developer at a local university, and Tami, a self-employed scientific illustrator and animator, have decorated their home with a unique mix of vintage and modern furniture pieces, creating a sleek, simple and stylish feel. It’s the same aesthetic that drew them to Modern-Shed, a company they have long admired. 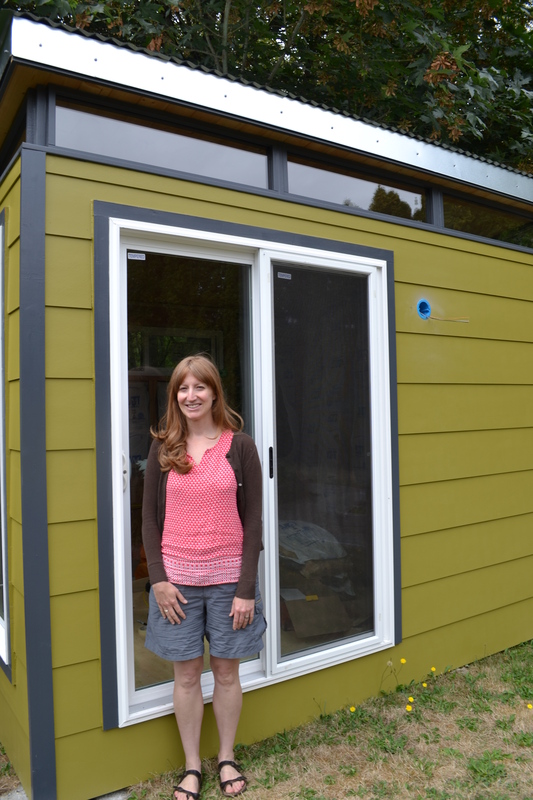 Tami has worked from home for at least 10 years and had entertained the idea of getting a Modern-Shed home office for quite some time, particularly after the couple’s son, Elliott, now nearly 4, came into the picture. 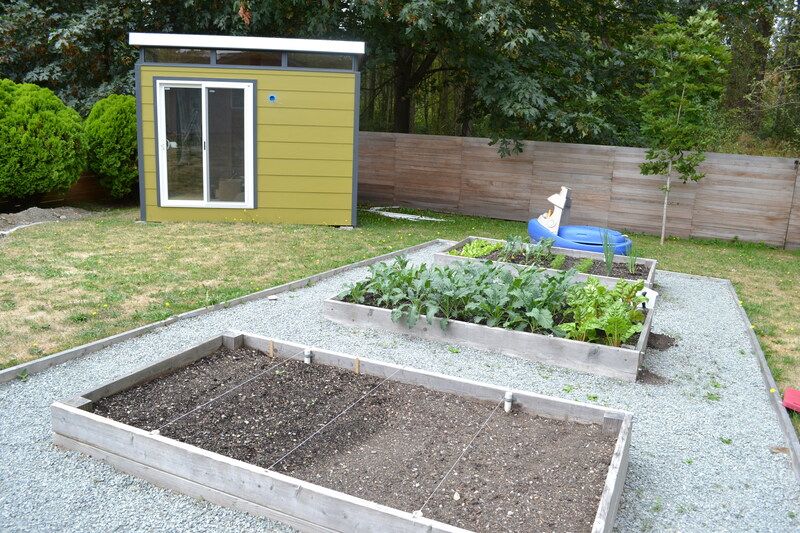 Tami and Peter took Modern-Shed’s advice to place their shed at a diagonal angle in the yard. Tami finally bit the bullet and decided to contact Modern-Shed in April. Tami and Peter had considered some of Modern-Shed’s competitors, but felt drawn to Modern-Shed in part because they like the pre-fab model. The couple selected a 10’ by 12’ Modern-Shed with birch paneling and a sliding glass door, instead of double doors. They painted their shed a chartreuse green. Tami works from home as a scientific illustrator and animator. She can’t wait to work out of her Modern-Shed home office. Tami felt surprised at how quickly the shed came together. The couple opted for the partial installation and plan to finish the wiring and interior paneling themselves, a process that has taught them a lot. They plan to turn Tami’s current home office into a guest bedroom or craft room. Friends, family, neighbors and little Elliott have already voiced approval for the Modern-Shed.